"In early 2015, my wife and I moved to the city of Wells in Somerset, England. Wells is famous for being the smallest city in England. In reality, Wells is a small town and it is only because of its Gothic cathedral (12th century with 300 sculptures on the west facade) that it is awarded city status," says novelist Vaughn Entwistle. 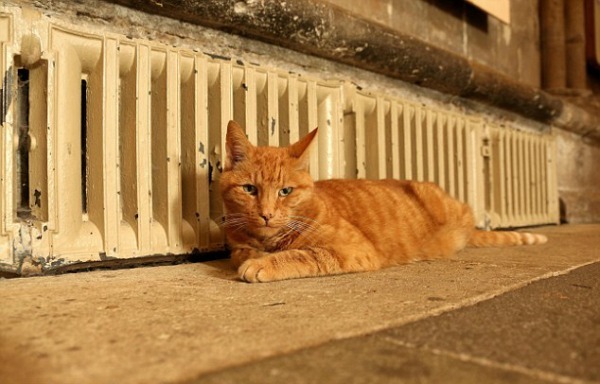 "Visitors to the cathedral will invariably run into Louis, the cathedral cat. 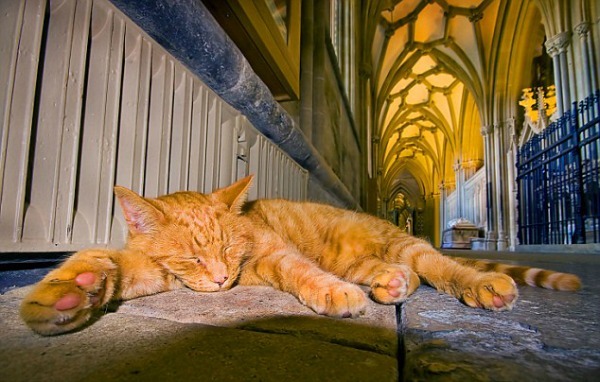 The ginger tom has free run of the mediaeval cathedral, although he can often be found snoozing in a basket in the gift shop. Louis even has a children's book based on his life in the cathedral, but I don't know if Louis does book signings." 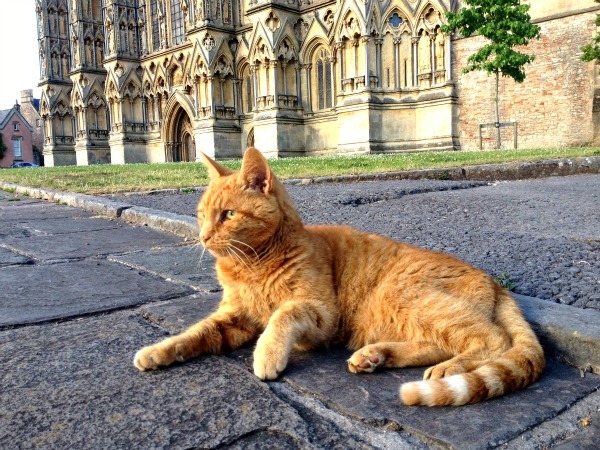 Pawfect, Wells is a beautiful town, just right for a handsome Push-T-Cat! Louis is a VERY handsome fella! I fell in love with Louis!!! Our school was cleaning out their library last year and offered books they wanted to get rid of to our students first. 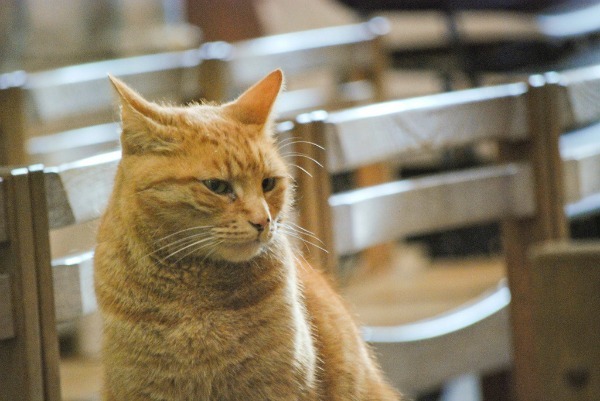 My son brought home "Louis, the Cathedral Cat", and I truly enjoyed reading it to him. We live in central Canada, what a small world! That is such a wonderful orange one! Good luck with the book. I find my books do quite well when offered for free. It's when I put a price tag on them things go wrong. 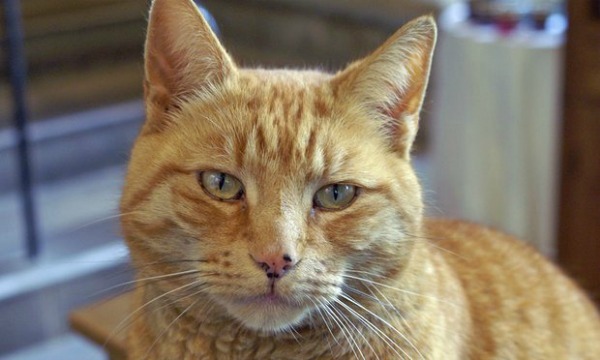 We have a 'Tom' cat who's adopted us here in Greece who looks much like this handsome fellow! Louis is such a cute kitty! What a handsome fellow! I love that he has free reign! Thank you for sharing with us at Photo Friday! 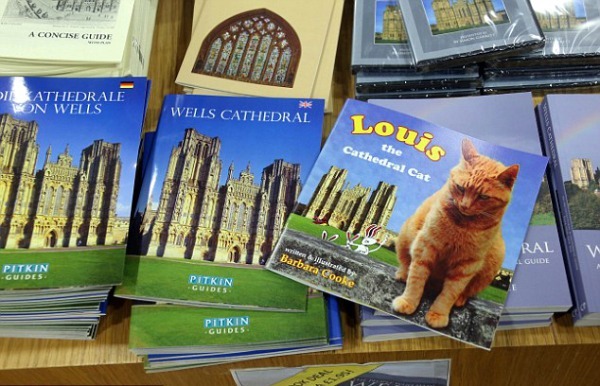 Perhaps you should take Louis the cat with you for book signings when you are out in paperback! What an amazing tail! What a cutie! His fur color matches the cathedral. Hello, Louis lives in a grand place. Beautiful cathedral and photo. Thank you for linking up and sharing your post. Have a happy weekend! What a stoic, handsome guy! Beautiful! Thanks for sharing at My Flagstaff Home! How awesome that he is so cared for at the cathedral! Congratulations! Your post will be featured this week on My Flagstaff Home! 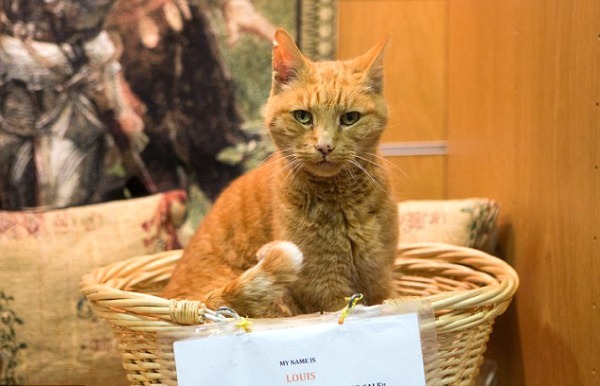 Louis is such a ginger beauty and it's awesome that he has his own book! How did I miss this beauty? My in-laws have two ginger cats and they are a trip. What e beautiful town and a lucky cat, beautiful as well. Have a nice week-end. Would love to visit here someday, beautiful photo of the cat! Beautiful photo. Merry Merry Christmas from La Condo Keisha to your abode. He is beautiful. I hope you had a Merry Christmas. Happy New Year too!